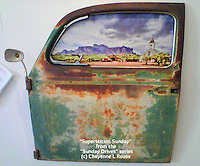 "Mountain Meadows" and "Superstition Sunday" are the 1st pieces in my "Sunday Drives" series - Where I take the viewer back to a time when Sunday drives were the highlight of the weekend and life was simple. 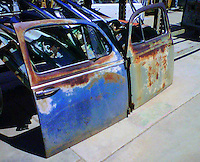 Authentic old car doors are used to showcase a Giclee Fine Art Photograph on Canvas and can easily be hung on the wall with the heavy gauge wire hanger installed on the back. Each piece in this limited series is a one of a kind creation. Please contact Cheyenne for pricing and shipping information.